On December 5, ECLA was happy to welcome Claudia Baracchi, professor at the University of Milano–Bicocca and Visiting Professor at the New School for Social Research. Claudia’s main areas of expertise include Ancient philosophy, nineteenth- and twentieth-century Continental philosophy, philosophy of history, feminist thought, philosophy of art, political philosophy, and ethics. Claudia was invited to give the final guest lecture on Book X of the Republic and Book XXIV of the Iliad for the core class on Plato and His Interlocutors. 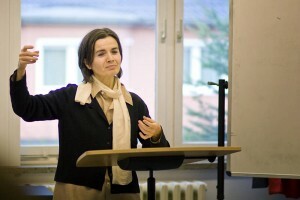 This was the first time that Professor Baracchi visited ECLA, but she said that she has been and still is “very curious” about our small but unique college. In the opening minutes of the lecture she noted that we have to deal with an ending, but a “festive” one. With Professor Baracchi we were also to take up the task to start from the beginning –to revisit Plato’s piece, so to speak, for with the Republic we are never dealing with something static. The text is never something fixed one can absorb once and for all. It is not a text, “which we have to read between the lines either, but one, whose every line must be read”. These initial remarks set the tone of the whole discussion and Claudia Baracchi’s voice, hertext, one might say, mirrors the voice of the Republic itself: every time one looks or turns to it again, it becomes alive; the fixed ‘dead’ interpretation one might have had is undone and the new doing of it starts again. The subject of doing and undoing was, in fact, one of the main underlying threads in Baracchi’s lecture. From Book VIII of the Republic and on we witness the undoing of the city-in-speech. Why was it erected in the first place, and are we going to do away with it towards the end? The city was created as a magnifying lens for that which we were not ready to see. We had toundo the city, so as to see what lies inherent in it: “the dynamics of justice and injustice”, or the dynamics of the human soul itself. We had to build something ideal, something which appears perfectly stable, to discover that it rests on the unstable power of desire. In the building of the city, we find that justice is sweet because it harmonizes with what is properly one’s own: one’s own activity and being. It is the unity among difference, which constitutes the invitation to authenticity, “the initiation of self-discovery and actualization of what is most one’s own.” The gradual construction of the city magnifies the construction and constitution of the human soul. The former’s tripartite hierarchy corresponds to the tripartite division of the latter. What seems to be at the top is the logon: calculation and reason. It is only an apparent hierarchy, however, because philosophy could not be possible with pure reason alone, and without passion. The logon is privileged because it does not overwhelm the other two constitutive parts. It oversees them and develops them in truth, in what is most properly their own. It watches over passion. The city and the soul models will become one – will achieve their harmony only when the philosophical becomes primary. But in Book VI, we notice a discrepancy between Socrates and the philosopher-king. The latter possesses the knowledge, whose goodness and ruling stem from it. In order to rule, he must know what is best for the ruled. Socrates never asserts that he knows and the fact that he is the one leading the discussion of the city brings the issue of what is best into question. Book VII further casts doubt on the stability of knowledge in relation to the city: the cave analogy forces us to consider the “unending circularity of going up and down, while each going down involves something taken from above without possessing it.” Knowledge is movement, not a condition. In Books VIII and IX we witness the undoing of the fixed city and knowledge and the doingor creation of mythology. The pure separation of being from seeming which was undertaken in Book II is, not coincidentally, now undone, because in the end we find each other always already in appearance(s). The end of the Republic is, then, “saved” (Republic, Book X, 621c), because the doing of the logos in myth is to be undertaken now.